Looking to replace that ugly council issued food waste recycling caddy with something that you would be happy to leave on display in your kitchen? 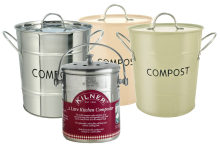 Hopefully you will find something suitable amongst our range of compost caddy bins and pails below. Modern and stylish tabletop compost caddy bin with buttercream powder coated finish. Would look good..
Modern and stylish tabletop compost caddy bin with sage green powder coated finish. Would look good ..
Modern and stylish stainless steel tabletop compost caddy bin. Would look good in any kitchen. Ma.. This practical compost caddy is manufactured from eco-friendly recycled bamboo fibre, but remains st..
Modern and stylish tabletop compost caddy bin with cream powder coated finish and stainless steel li..
Modern and stylish tabletop compost caddy bin with sage green powder coated finish and stainless ste..
Modern and stylish stainless steel tabletop compost caddy bin. Carbon filter inside the lid helps to..